Cambridge Rectangular Pre-Packaged Waterfall Kits With 16 Color Lighting Options In One! Add the peaceful sound of a pondless water feature to your backyard ambience. 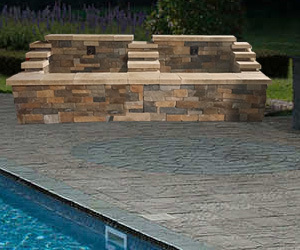 The rectangular waterfall kit is complete with 112 pieces of Olde English Wall. Both feature a 24"-wide waterfall and a one-piece, 33-gallon basin with pre-filtered pump chamber, Tidal Wave 2 Pump and Matala filter mat. Select one light color or run all 16 sequentially by remote control. Ready to install... absolutely NO cutting necessary. Step-by-step instructions included in English and Spanish. Cambridge Round Pre-Packaged Waterfall Kits With 16 Color Lighting Options In One! 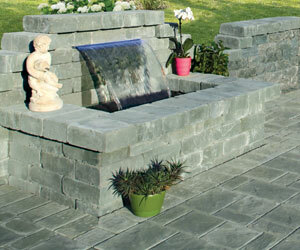 Add the peaceful sound of a pondless water feature to your backyard ambience. 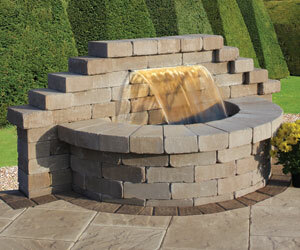 The round waterfall kit is complete with 20 pieces of Olde English Radius Wall and 62 pieces of Olde English Wall. Both feature a 24"-wide waterfall and a one-piece, 33-gallon basin with pre-filtered pump chamber, Tidal Wave 2 Pump and Matala filter mat. Select one light color or run all 16 sequentially by remote control. Ready to install... absolutely NO cutting necessary. Step-by-step instructions included in English and Spanish. All-in-one convenience when building a custom water feature, the Kit comes complete with: two brass wall spouts, one 4' x 2' x 16" flexible basin, one control module/remote/splitter for lighting, and one TT1500 Pump - ready to use along with your choice of Cambridge Wallstone or Stone Veneer (not included).